JAL will be serving 2013 Beaujolais Villages Nouveau on Beaujolais Nouveau Day. Image by Japan Airlines. Beaujolais Nouveau is a French red wine made from Gamay grapes from the Beaujolais region and has a very short fermentation time. This is still produced in the good old ways so quantity is limited. Every year, the wine is released to the public on the third Thursday of November. Similar to last year, Japan Airlines (JAL) will once again organize a special Beaujolais Nouveau Day to celebrate the release of Beaujolais Nouveau 2013. JAL will be serving the 2013 Beaujolais Nouveau from Pierre Ferraud & Fils and a JAL Original bread, PAIN AU BEAUJOLAIS, from Maison Kayser created just for this occasion on select international flights and at the select lounges in Japan on the release day, i.e. November 21 2013, so JAL customers can enjoy the wine as soon as possible when it is fresh and fruity. 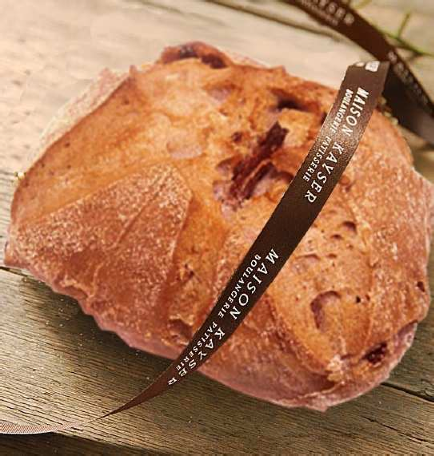 JAL Original bread PAIN AU BEAUJOLAIS created by Maison Kayser. Image by Japan Airlines. JAL will be serving 2013 Beaujolais Nouveau on flights between Japan and Los Angeles, San Francisco, San Diego, Vancouver, Chicago, Boston, New York, Honolulu, London, Frankfurt, Paris, Helsinki, Sydney, Singapore, Kuala Lumpur, Jakarta, Delhi, Manila, Hanoi, Ho Chi Minh City, Bangkok, and Hong Kong in First Class and Business Class. JAL will be serving 2013 Beaujolais Nouveau at the domestic and international lounges at Tokyo Narita, Tokyo Haneda and Osaka Kansai, as well as the domestic lounges at Osaka Itami, Nagoya Chubu, Sapporo New Chitose, and Fukuoka. JAL will be serving this JAL Original bread on flights departing from Tokyo Narita to Los Angeles, San Diego, Vancouver, Chicago, Boston, New York, Honolulu, London, Frankfurt, Paris, Helsinki, Sydney, Singapore, Kuala Lumpur, Jakarta, Delhi, Manila, Hanoi, Ho Chi Minh City, Bangkok, and Hong Kong in Business Class. This will be served as during the first meal service as the bread roll of the Western menu. The first batch of the wine has already arrived Tokyo Haneda on November 5 2013. They were transported on JL042 from Paris CDG to Tokyo Haneda this year. Japanese aviation site Aviation Wire has some pictures of the arrival.